Cooking With Kids is enjoyable and brings families together! It has been a wonderful journey! A NEW season! Welcome Spring. I’m looking forward to a new opportunity that is happening this week. 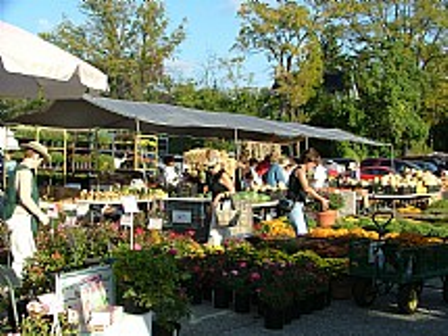 On Thursday I will be the guest chef at this Farmer’s Market in a beautiful community! I will be there at 9am. Below is a link below to their website and there is a link to the chefs series schedule. Please come out and see me. I’m about to hit a half a million views of my Youtube videos. Now to most, that may not seem that significant – as we all know, there’s some singing dog out there that has millions of hits. But for me, 500,000 feels big! I am certainly a niche chef – people have to work a little harder to find me. What started out as a fun thing to do with, and for my boys, turned into something much larger. I have had so much fun doing something I never imagined I would do. Thank you to all who have supported me, encouraged me, and have expanded their culinary skills. More to come! I was looking on-line to see what some of the most requested Chinese recipes are. This one was in the top 10, and one of my (and the kids) favorites too! 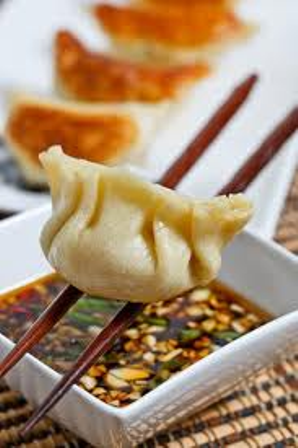 These dumplings are one of the “lucky” foods served during Chinese New Year – the crescent-shaped dumplings with pleated edges are thought to resemble ancient Chinese money. In northern China, families have jiaozi-making parties on Chinese New Year’s Eve. Definately a simple and tasty dish to make! 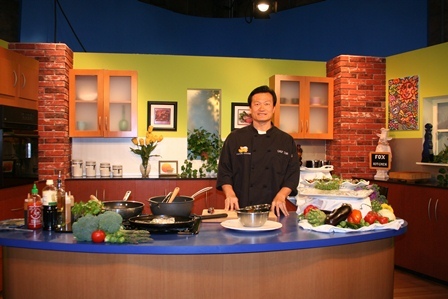 I had the opportunity to do another cooking segment on Fox News – WJBK. Today I prepared all vegetarian dishes for their “Meatless Monday” segment. Below is a link to see the video. The recipes are also listed on their website. 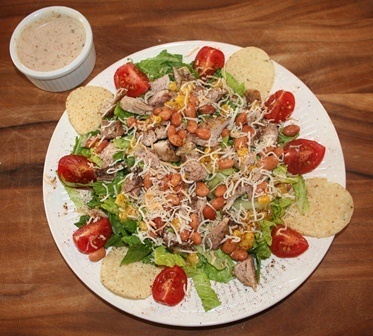 In honor of salad month, here is one of my recipes for a delicious steak salad. 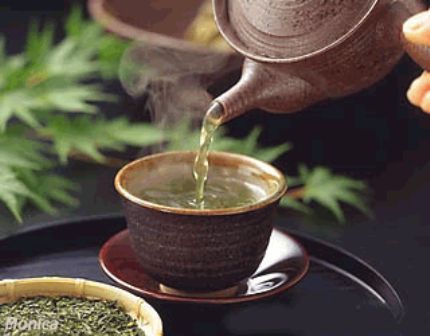 It’s long been known that there are many health benefits to drinking tea. I try to have at least a cup or two a day. My favorites are green and black tea. I like to add a small piece of ginger, honey and a slice of lemon. It is so relaxing to have a cup before bedtime. Check out this article/link about the different types and how they can benefit your health! Romaine lettuce, tomatoes, grilled chicken that has been prepared with 1/2 a packet fajita seasoning mix, corn, beans, shredded Mexican cheese and some tortilla chips. The dressing is made with ranch mixed wth some of the rest of the packet of fajita mix. Simple and tasty! Five-spice powder is a mixture of five spices used primarily in Chinese cuisine but also used in other Asian cookery. Other recipes may contain anise seed or ginger root, nutmeg, turmeric, Amomum villosum pods (砂仁), Amomum cardamomum pods (白豆蔻), licorice, black pepper, Mandarin orange peel，or galangal. In the South China, Cinnamomum loureiroi and Mandarin orange peel is commonly used as a substitute for Cinnamomum cassia and cloves, respectively, producing a different flavour for southern versions five-spice powders. Five spice may be used with fatty meats such as pork and duck. It is used as a spice rub for chicken, duck, pork and seafood, or added to the breading for fried foods. Five spice is used in recipes for Cantonese roasted duck, as well as beef stew. It is used as a marinade for Vietnamese broiled chicken. 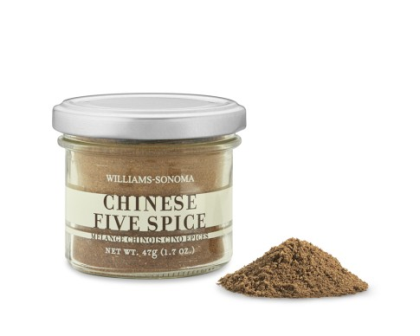 The five-spice powder mixture has followed the Chinese diaspora and has been incorporated into other national cuisines throughout Asia. Although this mixture is used in restaurant cooking, many Chinese households do not use it in day-to-day cooking. In Hawaii, some restaurants place a shaker of the spice on each patron’s table. A seasoned salt can be easily made by dry-roasting common salt with five-spice powder under low heat in a dry pan until the spice and salt are well mixed. Give this a try – you will find it in many of my dishes. Enjoy! Do you know about Brunei?? I was born in Taiwan. I have lived in many places since – Malaysia, Singapore, Brunei, and the U.S. Although I have great memories of them all, Brunei sticks out in my head. I lived there from age 2 until 10. I remember cooking with all of my family members – from littlest to big, we all had a part to play. I am sure that living there influenced my desire, passion and interest in cooking. What was so special about Brunei, was the different influences on the cuisine. There was Indian, Malay, Chinese and French. The ingredients that stick out in my mind were the bountys of fresh seafood, curry, chiles (spicy), lime and cooking with a lot of fresh fruit…..especially rambutan. I am including a link if you want to learn more about Brunei. I hope to get back there some day soon! 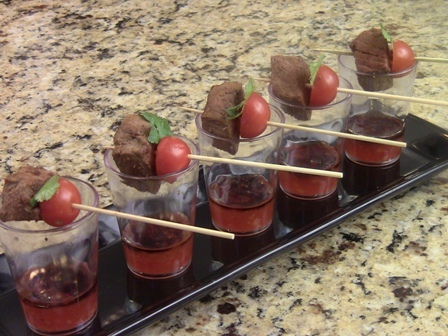 This makes a terrific appetizer!